The Czech Republic and Hungary top the world for mobile video performance – even though they don't have the fastest networks. While politicos and telco marketing departments are obsessed with the headline figure of broadband speeds, the download rate doesn't give you the complete picture of network performance – particularly when watching video. Wireless coverage mapper OpenSignal's global survey of network performance in 69 countries found that while South Korea boasts the best pure download speed, nations with slightly slower ratings are better for video, once buffering and video resolution are taken into account. The Czech Republic is 11th globally for file download speed, but rated first for video performance. 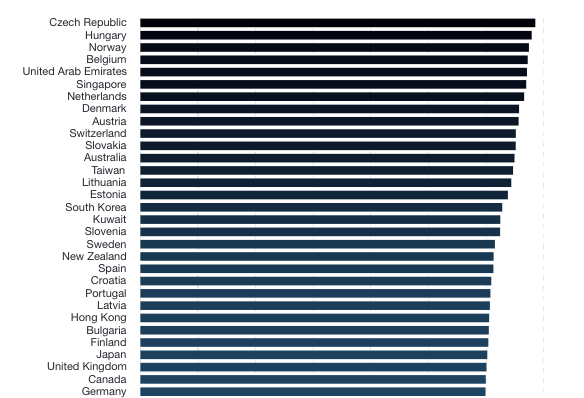 Hungary, on the other hand, is seventh for speed, but second for streaming vids. "Speeds and video experience are loosely related, but it is possible to offer a good mobile video experience even without fast download speeds," said OpenSignal, which derived the data from 87 billion measurements on 8 million devices between May and August this year. The UK ranks 30th for speed and 29th for video performance, ahead of France and Germany in the latter category, and on a par with Finland, traditionally cited as a bleeding-edge mobile market. OpenSignal added: "Countries with extremely powerful LTE networks in terms of download and upload speeds, availability and coverage, aren't always providing the best video experience. And no country we've analyzed has managed to achieve the highest level of video streaming quality."